We’ve been living in the week for a week and love it. There’s still people walking around the house painting and doing miscellaneous work (door knobs, steel installations, etc.). We’re also still unpacking and I’m finishing up my A/V setup, which amounts to untangling all the wires by the rack and making them nice and neat and putting all the receivers and Apple TVs in the rack. 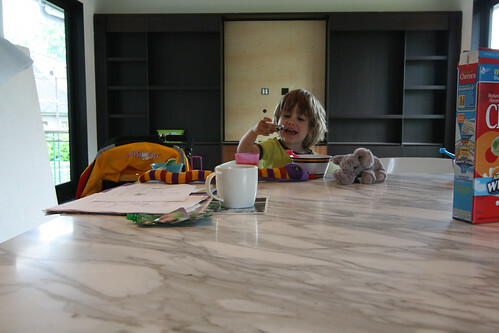 I’m glad we moved in before it is 100% complete. We get to see all the little things get finished, we have more time to make sure things like paint problems get fixed and we get to watch the decks get built. Twisted Metalworks installed the basement stair guardrails the morning after we moved in. They look great and they have the bolt + bronze washer combination that I love, but Schuchart/Dow had to do some work to make it tight against the stairs, to pull the bottom of the steel outward (steel likes to bend, apparently) and Twisted still has to weld a flange on to bolt it to the other wall. 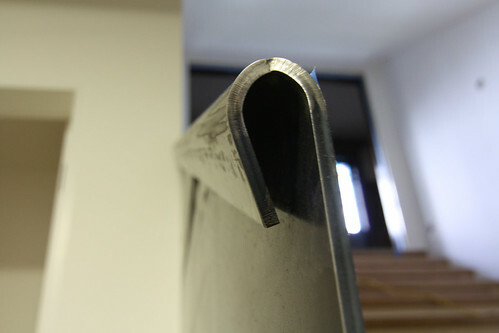 The steel risers arrived too, but some of them don’t quite fit, so Twisted had to take them back and fix that. Then the glue that they planned to use wasn’t holding them, so we decided to put countersunk screws in instead. So they had to take them back again to drill holes in each one. Twisted isn’t the only one with steel issues. 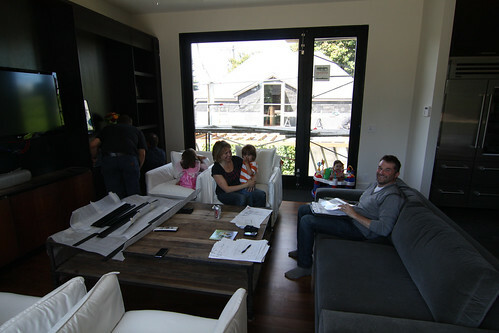 12th Ave came over on Wednesday to install the rest of the steel cladding and door pulls on the family room cabinetry. Even though they templated for them, they decided in the shop to cut 1/8″ off one side so when they brought them over, they were too small. They took them back to remake them. Things are never done. The stucco guys came back to put stucco on the garage wall that faces the house used to be covered in wood. Tim and I worked on getting custom screens built for all the operable windows throughout the house. We had originally planned to have the company that restored the windows build them, but their prototypes weren’t working out so we put that on hold months ago. My idea was to build frames thin that match the window trim and have them held on with little magnets. This way, they’d look like there’s no screens in at all and there’d be no hardware on them, so the screens would look built-in. We weren’t sure magnets would be strong enough to hold them in when gusts of wind kick up, so Tim built one and we put paper on it to simulate a screen. He got tiny rare earth magnets with little cups that supposedly magnify the magnetic strength. I’d never seen such a thing and they were strong! Four little magnets, two on each side, grab the frame when you put it in. We left it up for 24 hours on the highest and windiest window to see if it stayed in place, figuring the paper will act as more of a sail than a screen. It held, so we decided to go ahead and have Tim build them all. They’re going to be great screens. They can be installed quickly and easily without requiring any tools and, when summer’s over, can be neatly stacked and stored in the backs of closets. The rest of the Schuchart/Dow guys started framing the deck and put a few feet of decking on top. Except that the decking has 1/8″ gaps between the planks, it looks exactly the same as the family room floor before it was finished. That’s going to look great when it reaches across to the house, hopefully next week so I can sit outside with the big doors open and watch the Tour de France from outside! Scot Eckley came over for a meeting about the landscaping work that will be done. We talked about minor details and he and Mark talked about implementation details. 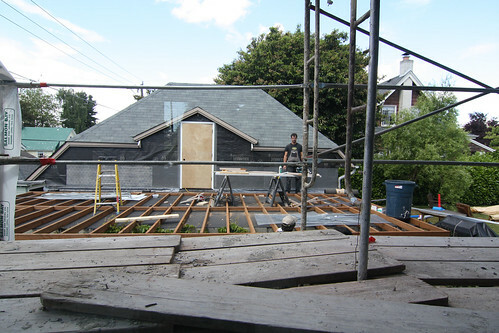 The concrete patio in the back will be removed next week and then they can put the deck footings in and start framing the south deck and start working on the concrete walls that surround the deck. Mark had the painters finish the back of the house first so they took that scaffolding away to get ready to remove the patio, so we can see the back of the house and not see scaffolding out those windows. They also took the dumpster away for good, so we aren’t staring at a big ugly dumpster. After a week of living in it, I thought we’d find things we didn’t like. There’s some minor things that will take getting used to. The kitchen island may be a few inches too wide because it’s hard to reach across it to grab things, I’m not a fan of the (almost) flat-bottom sinks that make it hard to wash things down the drain, all the sink faucets in the entire house give you hot water by pulling the control towards you… except one that is the opposite and that always confuses me. We feel like we’re sitting in a fishbowl when in the family room because of all the glass and lack of landscaping in the back. Oh, and the Sub-zero ice maker is noisy! It sounds like footsteps (which is scary at 4am) when the freshly-made ice cubes fall into the bucket and we can hear it from our bedroom. It still doesn’t have the cabinet door on the front, which may quiet it a little, but I suggested to Kurt and Mark that we find some insulating material to sandwich between the door and the cabinetry and they think they have something that should help. Sub-zero knows about this; we called them and they explained that it has a delay button to turn it off for 2, 4, 6 or 8 hours, i.e., during your party when you want it be quiet. That’s that price we pay, I guess, for the wonderful ice cubes it makes. I love the automatic Toto toilets, just use it and walk away knowing it’ll flush and close all by itself. But after a bit of tinkering to figure out why the remote on one of the toilets only works intermittently, we’ve discovered a flaw in the design: the wall-mounted remote uses infrared rather than radio to talk to the toilet (why?!) and the powder room is so dark, including the ceiling, that the light doesn’t reflect off the walls enough so the remote doesn’t always work. We temporarily fixed it by taping a piece of white paper to the ceiling and it also works if you put your hand over the IR emitter to reflect the light back towards the receivers on the toilet. We need to come up with a better solution. But come on, Toto, you should’ve put the IR emitters on the bottom of the remote pointing towards the toilet, not the top pointing at the ceiling. They must assume that everyone will paint their ceilings white. I’ve used the sauna three times already. I had no idea I could stand 180° F or that I’d like it. After a quick shower, I sleep like a baby — that is, if babies slept through the night without waking up screaming every hour or two. It’s still strange to have people walking around and painters walking around on the scaffolding outside our windows, but it’s been a fun week. This morning was chilly and our kitchen floor wasn’t warm on our feet so I texted Mark at 7:30a asking him about it. By 8:30a, on a Saturday, he and Tim, the HVAC contractor, were here figuring it out. That turned out to be just a temperature setting on the boiler that was set too low. Tim changed it and almost right away the temperature gauges on all the pipes in the mechanical room starting moving up — it’s quite a set up of piping in there and I got a tutorial on how it all works. We’ve already had a couple people assume that the basement is still not finished since the floor is just etched concrete, the ceiling joists are exposed and the walls are stark white (Super White!). Two guys came over to assemble the Nautilus weight machine and, on their way out, one asked me “Are you guys going to renovate this place?” Uhh, it was completely renovated! I think most people who do this much work to their house soon realize that they are the only people in the world who like everything about it. Good thing we’re not selling it anytime soon. Is the beard a requirement for the new house? :>) !! I don’t understand. What beard?